Hey Guys! Sorry for the little break in posting – I spent the last couple of days running around NYC going to meetings and eating everything in sight. I had a great time but it feels SO good to be home. I’m going to put up a little recap soon, but in the meantime, here’s the quick and easy dinner Mike and I will be eating tonight. 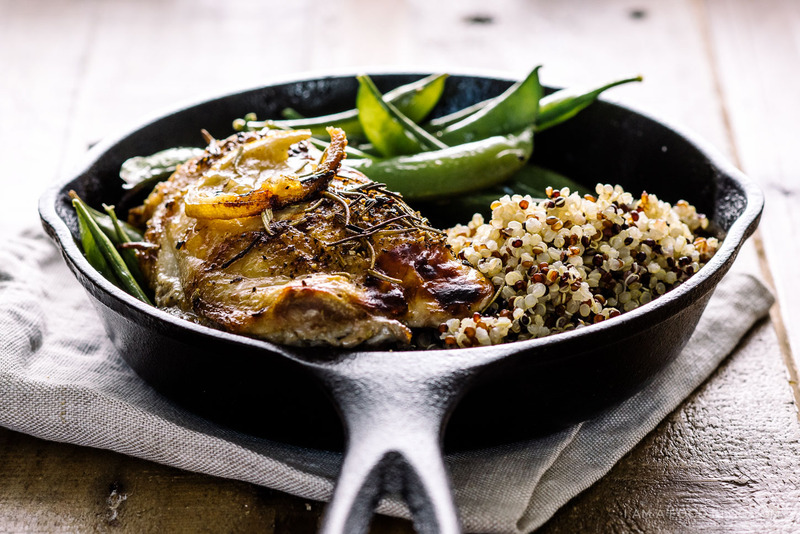 This is one of my go-to recipes because it’s just one pan/skillet (aside from the quinoa or rice) and it’s basically hands off. 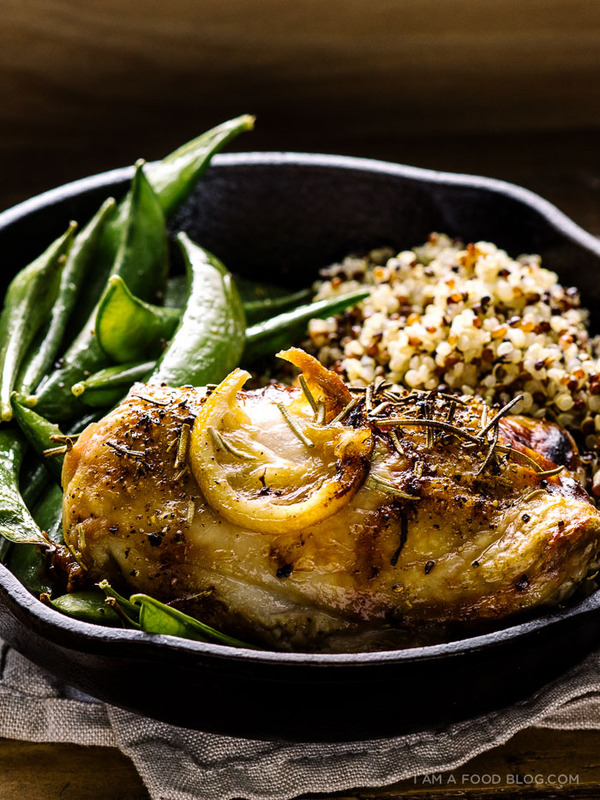 How could you not love juicy chicken thighs, rosemary, lemons, garlic and olive oil? All you do is put them all together in a pan and roast in a hot oven, no searing needed. I like to toss in some sugar snap peas during the last bit of roasting so we could get some greens in. 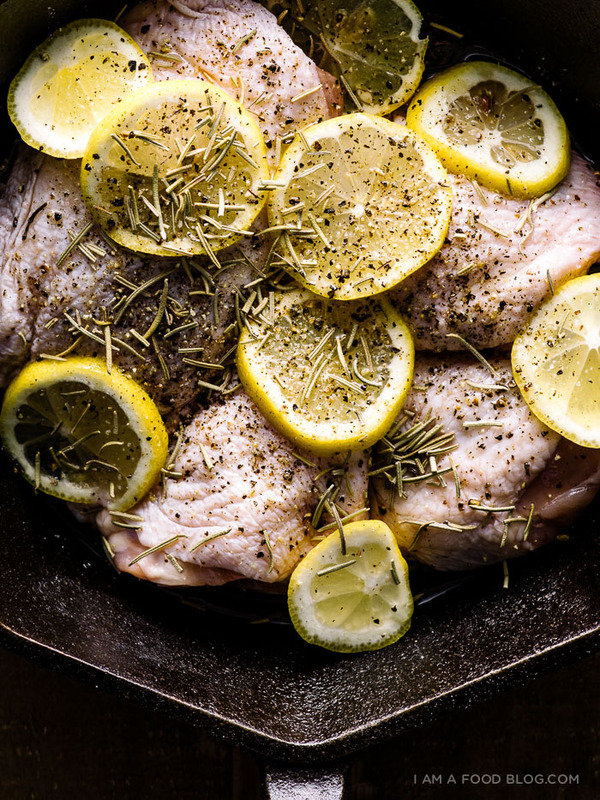 In an oven proof baking dish, toss the chicken with the oil, rosemary, garlic, and lemon slices. Season generously with salt and pepper. Arrange the thighs skin side up. 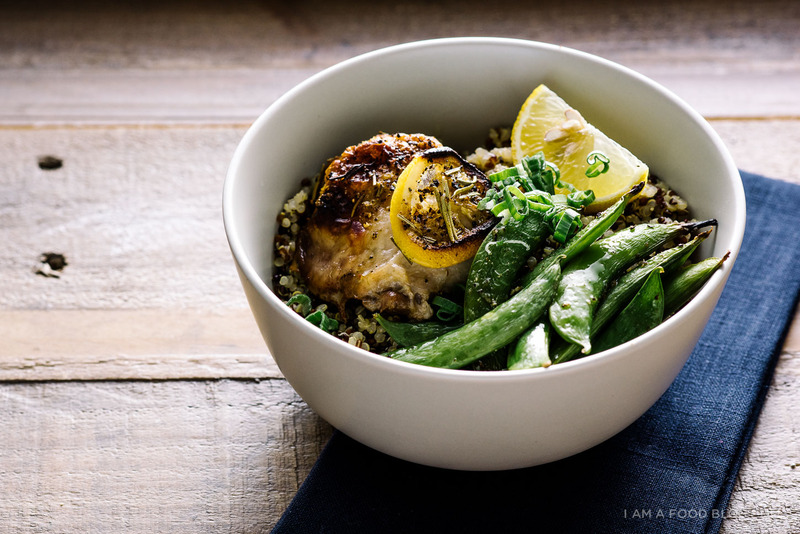 Roast for 30 minutes then add the sugar snap peas around the chicken thighs. Turn to broil and continue to cook until chicken is slightly browned and sugar snap peas have started to blister, another 5 to 8 or so minutes. 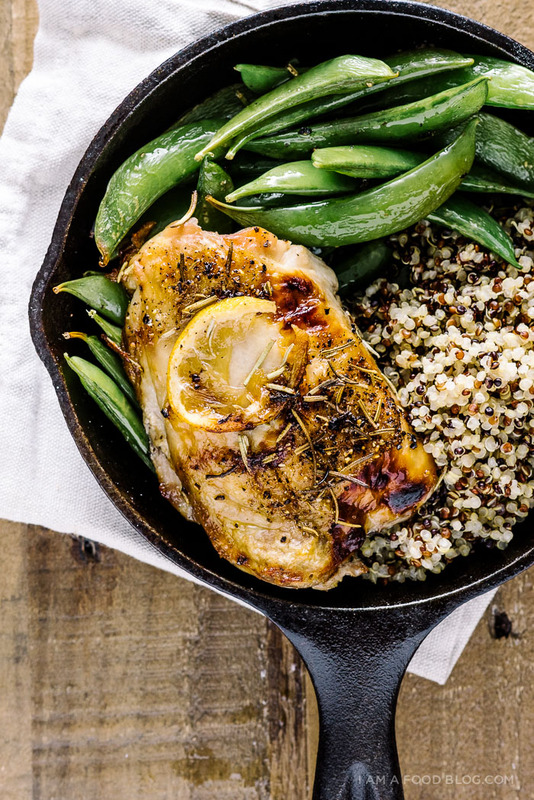 Enjoy on top of cooked quinoa, or grain of choice. Note: I would have preferred fresh rosemary, but I made do with dried – use what you have on hand. Looks like you were having fun in my old stomping grounds. I hope you got a chance to visit Flushing, Queens, where some of the best Asian food is available for dirt cheap! This chicken looks like its dripping with flavor. I love the idea of quick-roasted sugar snap peas; softened but not mushy (my dad has obliterated many bunches, and I’m still not fond of mushy peas). YUM YUM YUM. So beautiful too. This is the perfect and easy dinner. Adding this to the queue. Can’t wait to see/hear more about NYC!! This looks delicious! One clarifying question: are these chicken thighs boneless or bone-in? If bone-in, how much would you adjust the cooking time? Thanks for posting! I love recipes like these: easy, delicious, healthy weeknight meals that make both me and my boyfriend happy. A winner all around! they’re bone in! i’ll update the recipe – thanks for the heads up! AHH these photos are BEAUTIFUL, Steph!! That top one is perfection! And this combo sounds like the perfect dinner. Sosososoooo good to see you last week :D:D:D I hope the rest of your trip was magical! Chicken thighs = affordable, flavourful, delightful! What’s not to like? This chicken thigh recipe looks fantastic. Thanks Steph! Aaah, this is so beautiful! Your photos stun me every time. And I just love how simple this is. 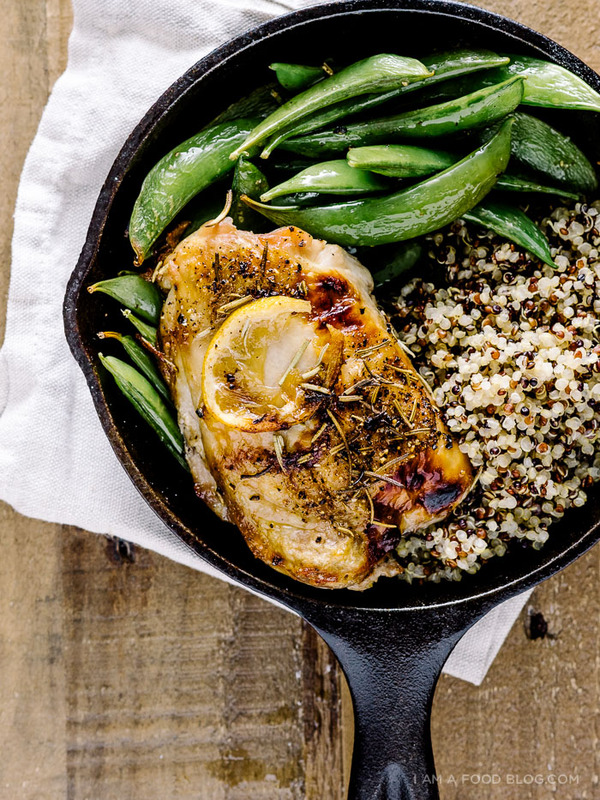 Throw it all in a pan and let the flavors do the work. Definitely going to be trying this sometime soon! This is pretty much all of my favourite things in one tasty dish. Also, roasted sugar snaps = pretty much the best thing ever. 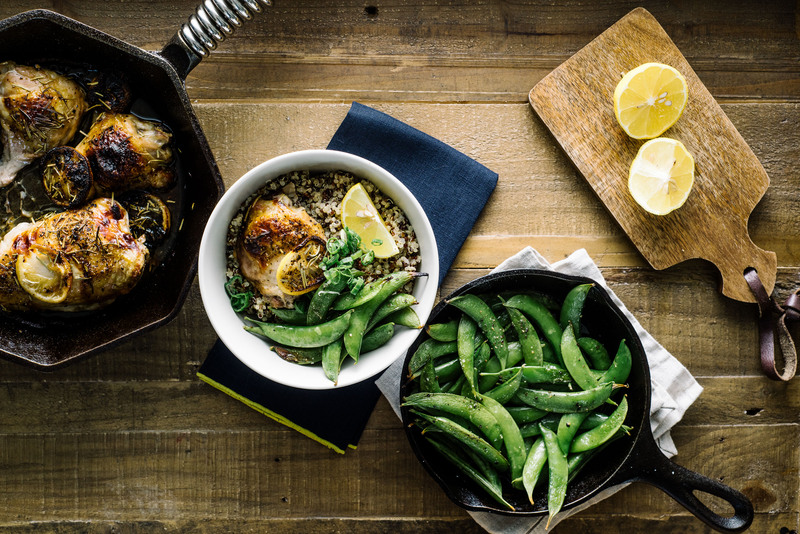 What a perfect weeknight meal! And boy could I live off sugar snap peas….oy! It looks delicious! I love all the ingredients and I can imagine how great that tastes. I made this last night and I LOVED it. The prep time is so short, and when it comes out of the oven, it just tastes so good! 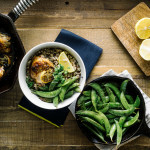 I also loved how the snap peas absorbed the lemon at the bottom of the pan. This is definitely a recipe I’m making again! You know how to make the simple looks stunning. Such a perfect spring dinner! Can’t wait to make this recipe, it looks so yummy. I shared the recipe link the other week with my RecipeVix email subscribers so hopefully there will be a few others out there making it too. 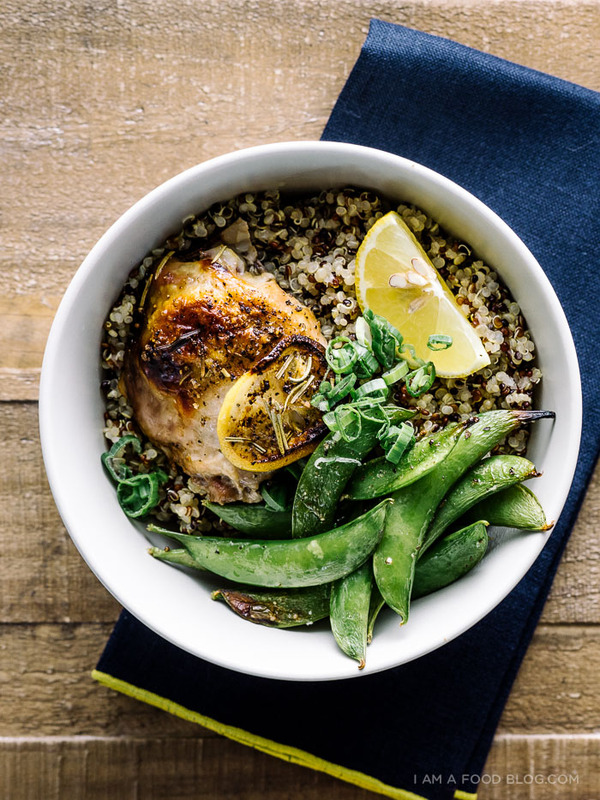 What’s not to love…chicken, sugar snap peas and yummy quinoa. YUM! I made this and it was very good. I used a whole bag of ready snap peas. It was double the amount the recipe called for, but I like them a lot. I also used boneless chicken thighs. I made brown rice to put it over. It was very good. I think next time I’ll add some pimientos.